Meghan is a healthy young girl who was diagnosed with Early Onset Scoliosis when she was 6 years old. Meghan came to see Dr. Vitale soon after she was diagnosed. At that visit her main thoracic curve measured 61 degrees. Since Meghan was presenting with a large curve and she had lots of growth remaining, Dr. Vitale recommended using MAGEC magnetically controlled growing rods. 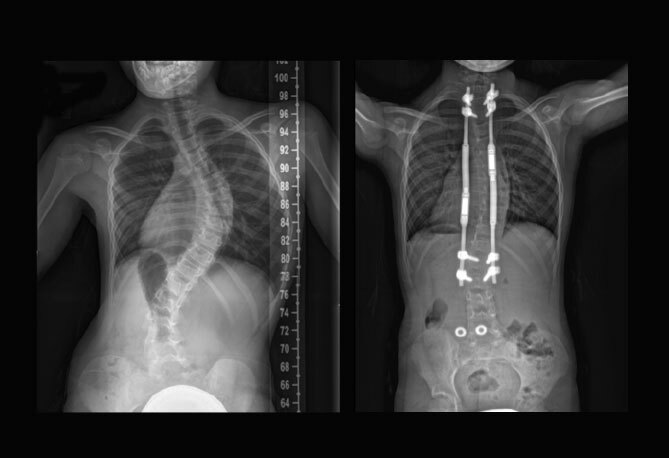 These rods are used in growing children to control the curve while still allowing the spine to grow. MAGEC represents a major advancement in growing rod technology because they can be lengthened painlessly and non-invasively at an office visit. Previously, patients with traditional growing rods had to go back to the operating room every 6 months for lengthenings. Meghan’s parents decided to proceed with the surgery and at her 6 week post-operative visit x-rays showed that Meghan’s curve had decreased to 31 degrees. The appearance of her back and her overall balance and alignment was drastically improved. Within 6 weeks of surgery Meghan was back to school and ready to start playing soccer again!